Want to know the secret to success? Nothing new here, folks. You just have to believe in yourself. Believe in your strength and perseverance. Believe that you can do it! 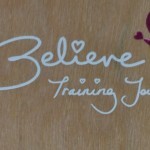 Belief and its first cousin, confidence, are two key ingredients to achieving your goals in running or any other endurance sport, whether that’s your first 10K or an Ironman. But don’t take it from me, take it from the pros. There are two types of confidence: respect for yourself as a person and respect for your athletic abilities. The successful athlete scores high in both areas. But confidence in either area can be easily lost, usually through our own initiative, because inside each of us is a small voice that likes to criticize. It often points out our shortcomings and limiters. Success comes in large part from merely learning to control that voice while providing constant positive feedback. You would be hard-pressed to find an athlete who would not benefit from increased self-confidence. Always act as if you are confident. It’s amazing what it does for self perception. 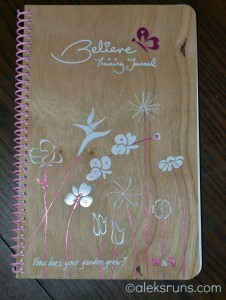 I bring this up today because I have just the thing to help you build that confidence: the B.I.A (Believe I Am) training journal, where you can reflect on your workouts, write down your achievements and race reviews, or just doodle and write anything that comes to mind as you undertake your journey of fitness and running: This is a super-cute and stylish journal, and yes: its front and back covers are made of thin wood! 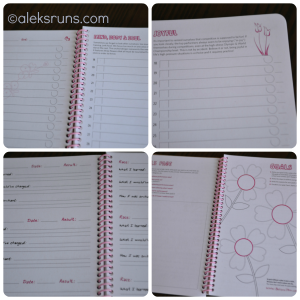 Inside, you’ll find pages to log your goals, training and race reviews, and inspirational messages on every page! And the best part: the journal is actually double-sided, so you can flip the back — and turn over to a set of blank pages to write just about anything you want 🙂 I have not one, but two of these babies to give away to two lucky winners! 2. Leave a comment here telling me what inspires you to stay on track with your training and goals. 4. Leave another comment here, letting me know that you tweeted. The contest runs through midnight on Saturday, May 11. The winners will be picked with a random drawing an announced on Sunday, May 12. Just a little Mother’s Day present from me! 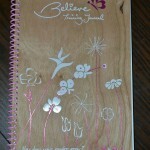 Disclosure: The ladies at BelieveIAm are not officially involved with this giveaway (I purchased the journals myself), but if they’re reading this, I’d just like to say: I love your stuff!! Today’s workout: Took a day off from running yesterday and another one today. My quads are hurting unusually much for 16-some Big Sur miles — but hey, those were some hilly miles! So today, we hit the swimming pool for some crazy drills. The kicks hurt, but everything else was just perfect! I have a goal sheet posted on my fridge. Signing up for a race definitely gets me out of bed in the morning to train! And knowing that I’m setting the example for my children for a healthy lifestyle. I’ve liked you on FB! What keeps me on track with my training is the thought of being able to push myself farther now than what I was able to in my 30s. My teammates and family inspire me to stay on track when I’m training for a race. When it’s difficult getting up early to run or fitting in a tempo after class, I think of how it will all pay off on race day. Having a running/workout partner always help keep me on track! While I can and do workout alone, it helps to have someone there with you reminding you why your doing it! 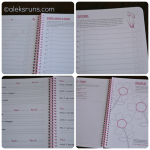 As I am working towards my first half marathon, planning my run, tracking my progress, and reflecting on it with my Brooks training journal has provided me guidence to hit my goal. It is amazing to see how far I have come in 4 months! What inspires me to stay on track with training and meeting my goals is my boys. Especially my teenage son. I don’t want my boys to see me give up or set a goal but not work towards it. I want them to see me as a positive example, so that in 10-20 years they can inspire their own children. The ladies of Moms Run This Town! Their stories totally inspire me. Sleepless moms of infants getting out there to run. Moms with babies strapped to them. Ladies that juggle work, family, and LIFE’s hardships, and still get out to train. They give me such perspective on life that I feel that I need to get out there because I have no excuse not to.